The weather and short days means long days riding are less now on the plus side this means time to reminisce over a great year and look forward to 2017 and my bank manager is probably happier. It’s been busy beyond belief, firstly with bike and car stuff with over 90 reports on the website, and that doesn’t count for when I have just been out for a bit of a potter around, but with family stuff and moving home, I am kind of looking forward to the couple of months rest we are given over the winter. But you know me too well and I shall be out and about New Years Day and any given chance. But we have been blessed this year in the south east with a lovely summer perfect for riding miles, we shall skip over the weather in May/June and during the Drink Drop and Doss Rally though when it was a bit damp. These miles increased even more so after my good lady pointed me in the direction of buying a new motorised bicycle and so far since February I have covered over 6000 miles on “Doris the Dyna” which is far above the previous couple of years even though most have been local’ish. I have managed many new to me events and even been seen camping twice, killing my tent at the second one which was sad after 35 years of ownership. As ever too many events to fit in for one year but I tried. So what for me have been standout events for me? Pecquencourt a very interesting event in France even if the rest of France was shut, the Friday night was cool and the show had some of the best Rat Bikes. A day out with Bert and Ernie Drag Racing, definitely I must do again soon. Leading a ride out, without getting anyone lost!. Having two feature bikes printed in 100% Biker magazine, still grinning inside due to this. Cow hunting on the bike, made a change from windmills. Now I am no longer in any members club, the first time for years , well there is of course my birthday bash at Easter, it’s a one day ride in event and all are welcome too attend even if to say hi. 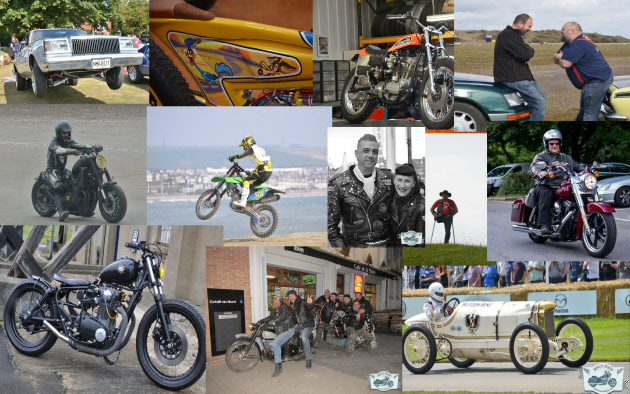 I already have some rallies pencilled into the calendar, and some tickets arranged thank you, and definitely have a few new events being considered Irish Bike Show, Bum in the Mud and Twisted Iron being some of them. I really do fancy a trip abroad on the bike as well, windmills and Holland come to mind but sadly cannot see being able to afford that as good lady wants a girly week, and who am I to say no and I may want another bike one day. Definitely the oldtimer rally in 2018 is pencilled in, but lets not wish the year away. Thanks to all who have made it such a great year, whether being clubs or individuals, there are far too many to mention and look forward to doing it all again next year.